The 3-acre Fallsview Indoor Waterpark in Niagara Falls. If you’re planning a family getaway to Niagara Falls this winter, take a break from the cold and have some fun at any of these amazing indoor attractions. Step out of the cold and into a tropical paradise at the Butterfly Conservatory, which is a lush indoor oasis located along the spectacular Niagara Parkway. Walk along winding paths and take in the sight of beautiful vegetation, trickling waterfalls, and thousands of spectacular butterflies fluttering overhead. Make sure to also check out the Conservatory’s Emergence Window where the butterflies leave their pupae and dry out their wings before taking their first flight. 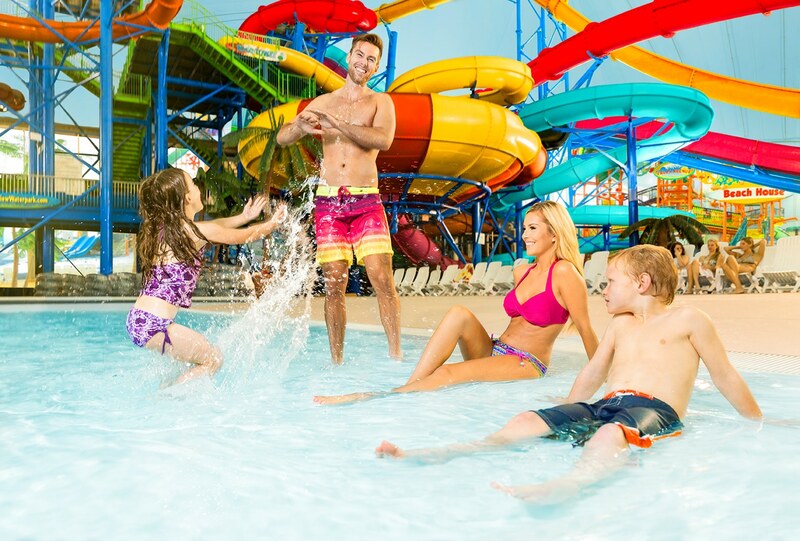 The 3-acre Fallsview Indoor Waterpark is a thrilling family-friendly destination where you can experience 16 waterslides, a 1,000-gallon tipping bucket, full-size wave pool, year-round outdoor activity pool and sundeck, plunge bowl, adult-only Jacuzzis, and more. And if you book a Holiday Magic Package at the Skyline Hotel & Waterpark you’ll receive $300 free in attractions, dining, and entertainment for the whole family, including four Fallsview Indoor Waterpark passes. Stop by Adventure City on Clifton Hill for a fun and exciting arcade experience featuring more than 125 classic arcade-style games and awesome prizes, which you can collect by redeeming game tickets. Adventure City also features the fun and interactive Tour Bus SWAT Team ride, Traffic Slam Bumper Cars, and the glow in the dark Wild Safari Mini Putt. Take a journey through the incredible Bird Kingdom in Niagara Falls to discover tropical birds and animals living among a beautiful indoor rainforest. The Bird Kingdom features an Animal Encounters area where you can meet friendly parrots and exotic animals, the Night Jungle, which is home to owls, bats and other fascinating nocturnal creatures, the World’s Largest Indoor Aviary where exotic colourful birds fly around freely, and Lorikeet Landing, where you can feed and interact with playful lorikeet birds.